The very beautiful holiday house is in Palit, 700 m far away from the sea with own parking . The house has grill in the garden. 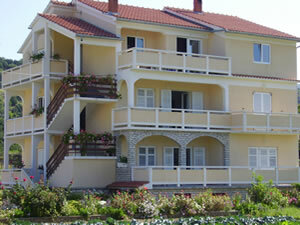 We are offering 3 apartments of the 1st category (*** stars). Kitchen: Table-ware, pots, cutlery etc. , electrical/gas cooker, 4 baking-oven, refrigerator, coffee machine, dishwasher. Pets permitted, Sat TV, bedlinen and towels available in the house, (1 large, 1 small/person and week)-weekly change. Apartment Nr.3 for 4-5 persons approx. 70 sqm, 2 double bed rooms, 1 room with auxiliary bed, two bathrooms (in rooms in dwelling), a living kitchen with Sat TV and balcony with sea view, air-conditioning. Kitchen: Table-ware, pots, cutlery etc. , electrical/gas cooker, 4 baking-oven, refrigerator, coffee machine. Own balcony with table and chairs for the balcony. Pets permitted, Sat TV, edlinen and towels available in the house, (1 large, 1 small/person and week)-weekly change. price include next :Sojourn tax, Electricity, water, bedlinen, air-conditioning, towel set, parking and final cleaning.